Tickets are now available for my talk at The Hukilau in Fort Lauderdale in June. “First Person Tiki” is all about tiki travel. Take a virtual tour around the world with me, get inspired to get out and see places with your own eyes, and learn some tips for doing it right. I’ve taken some care to make this talk interesting and useful to both tiki travel novices and experienced globetrotters—when Dean Curtis (a.k.a. The Jab) said he loved the talk and had learned new things at Tiki Kon in Portland, I breathed a sigh of relief that I’d achieved that tricky goal. It’s a fun talk for me to give, and the standing-room-only audience at Tiki Kon seemed to enjoy it, too… I can’t wait to share it with you guys in Florida. The talk is happening Saturday, June 11 at 10 a.m. Hukilau passholders can buy tickets now. I’ll also be giving my “Tiki: A Story for Bartenders” talk… at the Mai-Kai! Because this talk is only open to people who work in the bar industry, tickets are not available on the Hukilau ticket site. I’ll have details on how to secure a spot for that talk soon; in the meantime, if you’re eligible to attend and would like to get in on it, let me know at humuhumu@critiki.com and I’ll make sure you’re in the loop for tickets. Every single one of the other talks happening at The Hukilau look amazing, and I want to go to ALL OF THEM! I’m especially keen to see Swanky’s talk about the history of the Mai-Kai (his book will be published soon, this will be a real treat of a preview). Otto von Stroheim is giving a talk on the origins of tiki urban archaeology, telling the tales of those who rediscovered tiki and kept it alive for a new generation. Beachbum Berry is giving a talk on WWII and tiki, and you know that’ll be fantastic. 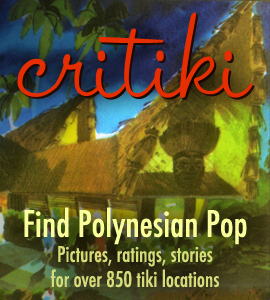 The Atomic Grog has an excellent write-up covering all of the symposiums and other attractions at this year’s Hukilau.